Santa, Mrs. Claus and his elves are joined by Christopher Turak during one of the Santa’s Workshop TV tapings. 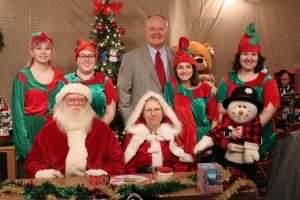 Today will be the first day to catch WJMH Media’s first episode of Santa’s Workshop on West Liberty University’s WLU-TV, Comcast Xfinity channel 14. The law firm of Gold, Khourey and Turak helped WJMH Media put on the telecast by donating $500 to the Broadcasting program. With the leadership of Carly McElhaney, the Broadcasting department has decided to use the money to help community members during the holiday season. WJMH Media also received help from other businesses and the staff at John Marshall High School. The other helpers include: Mrs. Wells who provided WJMH Media her Christmas tree and decorations, Wal-Mart who loaned WJMH Media all the wonderful toys shown on Santa’s Workshop, Mr. Booth who lent WJMH Media the workshop table, and Abby Bunch with Chairital Bliss who donated her time and equipment for the decorating of the set for WJMH Media. While getting ready for the holiday season, children across the Ohio Valley sent letters to Santa. The letters will be read on the show, and pictures will be displayed of the children who sent in a photo of themselves. To watch WJMH Media’s production of Santa’s Workshop tune in daily from December 3, to December 24, 2018 on West Liberty University’s WLU-TV, Comcast Xfinity channel 14. New episodes will air every Monday. The show times are at 7:00 am, 7:30 pm, and 10:30 pm.